This indicator helps you to Scan symbols which are in the Market Watch Window and filter out trends with alerts. When box color changes to "Green" or "Red" color, it indicates you for trend change for long and short entry. And also you will get alerted on screen. When it changes to "Green", it indicates you that trend is going upwards, and you can take the long entry. If the color changes to "Red", it indicates that trend is going downwards, and you can take a short entry. You can apply it on any timeframe which is suitable for you. SuperTrend ATR Period: the number of bars used for the indicator calculations. Proper values - from 8 to 21. SuperTrend Multiplier: Proper values - from: 1.5 to 3.5. 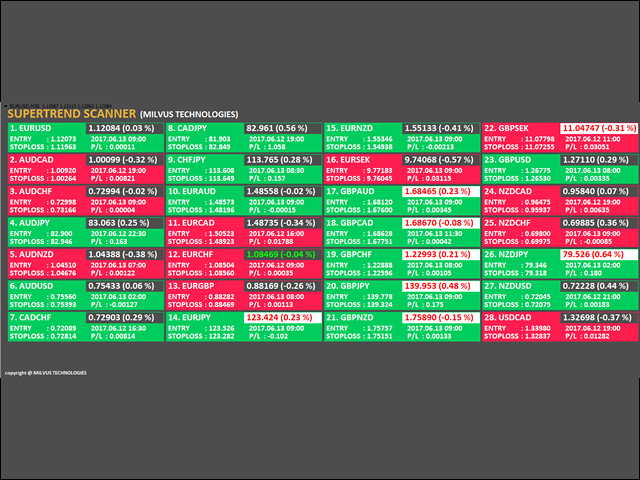 You can use this scanner above 15 Minutes to Daily. For best results you can use M15, M30, H1 timeframe. Green color shows the trend is up for that symbol. Coral color shows the trend is down for that symbol. Dashboard for the supertrend indicator.